BRISTOL - Having three days off earlier this week will be beneficial to the Bristol Blues’ pitching staff, but could potentially hurt Bristol in another way. In a 7-1 start to the summer, the Blues resembled a team with dominant pitching and a batting order that could hit from top to bottom. Over its first eight games Bristol held opposing offenses to 16 runs and scored 31 runs of its own. But since that strong start, Bristol has lost its form. 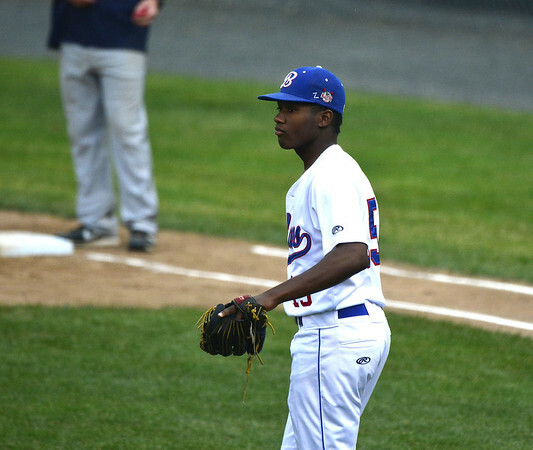 The Blues have gone 6-10 over their previous 16 games entering Thursday night against the Pittsfield Suns and pitching struggles have been a big reason behind the skid. Bristol pitchers have allowed 98 runs in that stretch, more than six per game. With the off days to work with from earlier this week and another three next week for the upcoming All-Star break, the Blues are looking to rediscover the form that resulted in their 7-1 start. The rest period should help to give the pitching staff a chance to regain its early season form. While the days off can only help the pitching, it comes at a bad time for the team. After Friday’s loss to the Worcester Bravehearts, Palmer wasn’t happy with the way his players approached the game. Bristol bounced back to win two straight over the weekend, 9-6 and 6-4 wins over the Nashua Silver Knights. Posted in New Britain Herald, Bristol Blues on Thursday, 12 July 2018 21:03. Updated: Thursday, 12 July 2018 21:06.